Winner of the Simcha Prize at the 2017 International Jewish Music Festival in Amsterdam, Big Galut(e) has been described as 'soulful and unselfconsciously poignant', 'jubilant', 'a real treat for open minds', and 'a serious band with lousy American humor'. Big Galut(e) performs a unique repertoire of Jewish music spanning five continents and six centuries. Highlights of the 2017 season include appearances in Amsterdam, at the prestigious Glimmerglass Festival, and on the New York Klezmer Series. Noted by critics for "the virtuosity of its members", the band has been heard on PRI's The World and WNYC's New Sounds, among many radio and TV outlets. The band has appeared as soloists with orchestra, at the National Yiddish Book Center, at chamber music venues (sharing season series with Dawn Upshaw and Zuill Bailey, among others), at colleges from Stanford to Oberlin to Hebrew Union, and at temples, synagogues, and JCCs from Hawaii to the East Coast. Clarinetist Robin Seletsky is a multi-faceted performer with interests in the classical music world as well as folk and avant garde styles. After graduating from New England Conservatory she attended the Juilliard School and for many years was Principal Clarinetist with the Binghamton Philharmonic and the Glimmerglass Opera Festival. 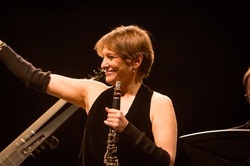 In 2008 she was cited by the New York Times for her work with Glimmerglass: "Robin Seletsky, the principal clarinetist, blew a jazzy solo onstage during "Too Darn Hot"...and offered stylish solos from the pit." Robin is equally at home with the klezmer style. She grew up listening to her father, the renowned clarinetist/composer Harold Seletsky (the “The Prez of Klez”), and has since found her own voice in this Eastern European folk style. She has performed around the country and as far away as India both as a klezmer soloist with symphony orchestras and as a member of Big Galute. Robin has given master classes on classical and klezmer clarinet styles at colleges and universities including Skidmore, Sonoma State, Hartwick and SUNY Binghamton, and her recordings and original compositions have been featured on NPR programs. Additionally, several of her works served as the inspiration for choreography by the St. Louis Ballet and the Vassar Dance Repertory Company. Robin can be found on the web at www.robinseletsky.com - her personal website where she blogs regularly, gives online lessons and where her video tutorials on klezmer style can be found. In addition to her work as a performer and teacher of clarinet, Robin is an adjunct instructor at SUNY Oneonta and Hartwick College. Professional affiliations include memberships in the International Clarinet Society and the Guild of Temple Musicians. She can be found online at robinseletsky.com. Sasha Margolis is a violinist, author, composer, and arranger, and sometimes he even sings. As a violinist, he is well-versed in classical, klezmer, new, early, and jazz music. Praised by the Washington Post for his “incisive, vibrato-rich tone,” he has performed chamber music in Italy, Japan, and throughout the U.S. At Spoleto Festival USA, Mr. Margolis was concertmaster for U.S. premieres of little-known operas by Janacek, Bellini and Donizetti, also playing and acting in Mauricio Kagel’s La Trahison Oral. As a chamber musician, he has collaborated with the Pittsburgh Symphony’s Andres Cardenes and Ann Williams, the Maia Quartet, members of the Corigliano and Pro Arte Quartets, and has played as a guest member of the Arianna Quartet. While a student at Oberlin College, he performed the Berg Violin Concerto with Robert Spano conducting. Mr. Margolis' klezmer-themed novel ﻿﻿The Tsimbalist﻿﻿ was published in February 2016. He has written for magazines including Strings, Chamber Music and Opera America. For Big Galut(e), he collaborated with his father, Sanford Margolis, to create the musical theater piece, The Tale of Monish. Mr. Margolis has appeared for a total of about two minutes on network TV: five seconds of these were spent impersonating a strolling violinist on ABC’s Lost; the remainder, reciting Shylock's "I am a Jew" speech on CBS Sunday Morning. He has played klezmer music since childhood. Michael Leopold holds degrees in historical plucked instruments from Sacramento State University (1998) and in lute and theorbo from L’Istituto di Musica Antica of the Accademia Internazionale della Musica (2004) in Milan, Italy. Originally from Northern California, he performs both as a soloist and as an accompanist throughout Europe, Australia, Japan, Chile, Mexico and the United States. In addition to his work with Ars Lyrica, the Catacoustic Consort and other American period-instrument ensembles, he has played with a number of leading Italian early music groups, including Concerto Italiano, La Risonanza, La Venexiana and La Pieta` de’ Turchini. He has also collaborated with several orchestras and opera companies, including Orchestra Verdi di Milano, Opera Australia, San Francisco Opera, Los Angeles Opera, Houston Grand Opera, Washington National Opera, Glimmerglass Opera, Chicago Opera Theater, and Portland Opera. He can be heard in recordings on the Stradivarius, Glossa, Naïve, and Naxos labels. Mark Rubinstein’s wide range of interests, his insatiable curiosity, and the unusual scope of his abilities have combined to generate a unique and diverse musical career. Mark’s main instrument is piano, but he has played drums in punk bands, electric bass in salsa groups, and accordion in settings ranging from symphony orchestras to avant-garde theatre pieces. His interest in ethnic music has led him to seek out performance opportunities in Greek, French, German, Italian, Mexican, Puerto Rican, Cuban, Brazilian, and traditional Jewish music. Mr. Rubinstein’s work as a recording engineer has led to Grammy nominations and platinum records for his clients, and his productions are noted for their clariety of sound and attention to detail. Career highlights include: music direction for the recent production of The Blue Flower by American Repertory Theater in Cambridge, MA, as well as an earlier production by Prospect Theater Company in New York; music direction for regional tap dance festivals Soul to Sole in Austin, TX and Third Coast Tap Festival/ Jazz on Tap in San Antonio, TX; performances (on piano) with legendary jazz flutist Herbie Mann, seminal jazz bassist Eddie Gomez, saxophonist Bunky Green, and legendary tap dancers Arthur Duncan, Dianne Walker, and Sarah Petronio; European tours with noted songwriters Dirk Hamilton and George Carver; membership in influential early Texas punk band The Rejects; and recordings (as engineer) with many noted artists including: Grover Washington, Jr., Shirley Horn, Cher, Liza Minelli, Judy Collins, Najee, Gerald Levert, Scarface, George Duke, Bobby Womack, Backstreet Boys, and Natalie Cole. Mark is currently the Audio Engineer for School of Music at The Ohio State University, where he teaches classes in audio recording, oversees recording activities for the school, and collaborates in the development of curriculum for the Music, Media, and Enterprise program. He can also be found online at www.markrubinsteinmusic.com.